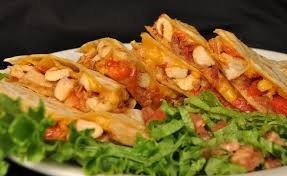 Two flour tortillas loaded with chicken, bacon, cheese, onions, roasted red peppers, & green onions, fried crisp & served with lettuce, tomatoes, sour cream & salsa. 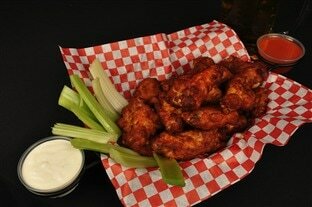 Our traditional crispy chicken wings can be served with original spicy Buffalo sauce & blue cheese or ranch dressing on the side. 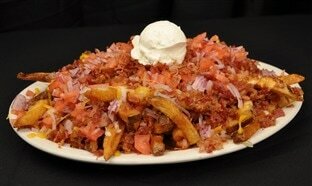 Or try them tossed in one of our tasty sauces. Either way comes with celery. 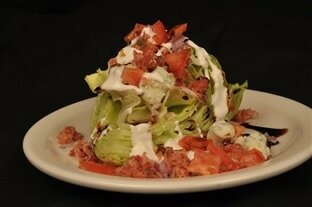 A crispy wedge of iceberg topped with blue cheese dressing, blue cheese crumbles, bacon, diced red onions, & chopped tomatoes, & drizzled with reduced balsamic. 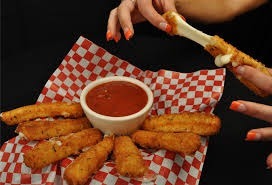 Housemade sticks of mozzarella, lightly breaded, fried until the cheese is gooey & hot. Served with marinara for dipping. 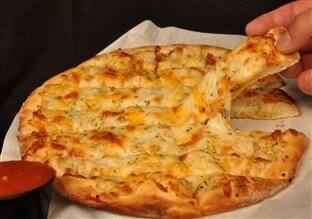 Baked fresh with garlic, Italian herbs, & oodles of cheese. Served with a side of marinara for dipping. Crisp romaine served with mushrooms, black olives red onions, tomatoes, croutons & 3 cheeses. Choice of dressing: Ranch, Blue Cheese, Italian, Caesar, Sesame Seed, Thousand, Honey Mustard, or Balsamic. Loaded with taco seasoned beef, refried beans, cheese, jalapeños, tomatoes, olives, sour cream & salsa. Romaine, croutons & imported parmesan cheese shavings, tossed in Caesar.